On Tuesday, July 22, 2014 we were able to photograph the interior of St. A's Catholic School and Holy Trinity Parish Church (Formerly St. Al's Catholic Church. We thank Merle Russo for making this possible and for adding interesting information along the way as we went about photographing the two buildings. First Catholic Church in ELO. A last Mass was held before demolition. Catholic priests can be seen through the doorway. 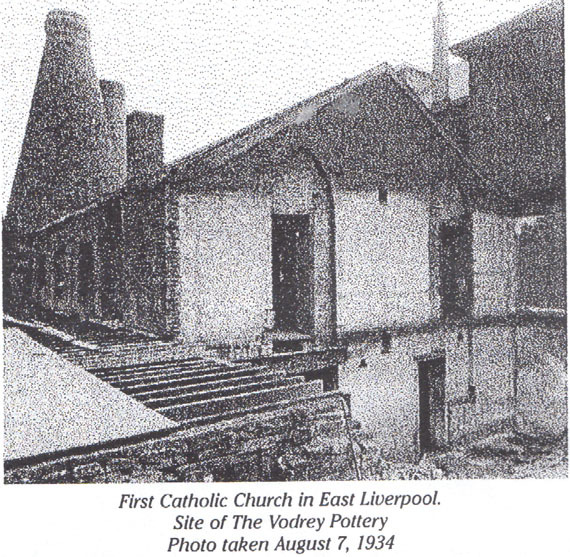 On a portion of the plot occupied by the Vodrey Pottery on East Fourth Street a section of its wall is now a part of the plant the first Catholic Church in East Liverpool was built. It was begun in 1837, but remained unfinished for several years due to a lack of funds which were earnestly sought by permission of Bishop Purcel in other Ohio congregations. By July 1841 the sum of $3,000 had been expended on the brick structure (40x70 feet) with a debt of $1,000. In the appeal sent out it was declared: "Considering our numbers we have succeeded in raising a beautiful and substantial edifice, one that will be an ornament to our town and a credit to our faith." Rev. James Conlon, the first priest to administer to the spiritual interests of the Catholics of East Liverpool, directed the building and financial activities of the new church. Rev. Mr. Conlon found ten Catholic families in the hamlet when he made his first visit in the fall of 1835. 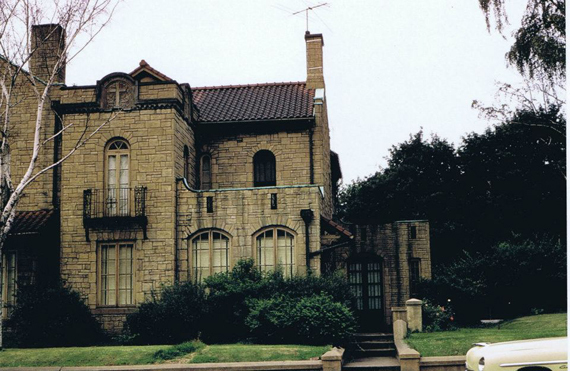 Meetings for sixteen years were held in the largest room of the spacious home of J. S. Blakely, a prominent citizen and generous Catholic. Though the mission was small and poor, decision was reached to build a church. Services were maintained in it in its unfinished state. But the necessity to meet the debt caused the appeal that was generously responded to and the building was completed. But before it could be then used an early morning fire destroyed it on Palm Sunday in 1845. It had cost $4,000. Stunned by their loss the members had recourse of the generosity of MR. Blakely whose home was used until in 1851-52 a frame structure was erected by Rev. James Monahan at Fifth and Jefferson streets which fronted the latter. It cost $1,000 and was 30x50 feet in dimensions. During Rev. P. J. McGuire's pastorate 25 feet was added to it at a cost of $800. 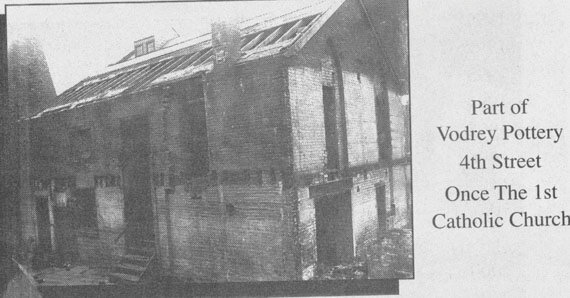 Timber for the original frame building on Fifth Street was prepared in Pittsburg and floated down the Ohio River on a raft to East Liverpool. During Rev. Carroll's pastorate also, in 1887, this structure was razed and the present St. Aloysius erected thereon at a cost of $30,000. It was dedicated on Oct. 5, 1890 by Mgr. F. M. Boff, V. G., of Cleveland. 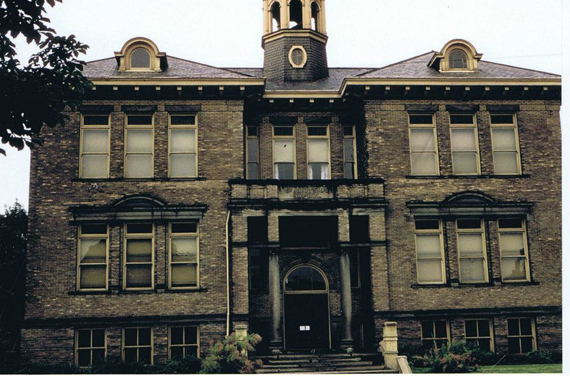 In 1913 the structure's brick walls were covered with cement, giving it at appearance of imposing stone. The entire repairs cost $7,000. In 1913 the structure's brick walls were covered with cement, giving it at appearance of imposing stone. During Rev. Mr. Carroll's stay in East Liverpool his residence on Fifth Street was converted into a school and the present parsonage site and initial residence on it purchased. He also purchased four and on-half acres of land on Pleasant Heights and devoted it to burial purposes. Rev. James Conlon attended East Liverpool as a mission from his home in Steubenville from 1835 to 1842 and from Dungannon until 1849. It was then made a monthly mission by resident pastors of Dungannon from 1849 to 1856 and from Summitville from 1856 to 1874, when after a few months it was attended by Rev. James Cullen from Wellsville. In the summer of 1876 Rev. P. J. McGuire built a comfortable brick residence on two lots on Fifth Street at a cost of $4,000, the land costing him $1,600. By Rev. Mr. Carroll this was used as a school. The present residence for church pastors was first erected in 1883. In 1903 during the pastorate of Rev. Thomas M. Smyth, a eight-room brick school house with all modern appointments was erected on the former site of the pastor's residence on Fifth Street at a cost of $35,000. During his early labors with the church old debts and improvements amounting to $14,000 was liquidated by him. Later a frame Sister Home was built just athwart the school building, which in 1919-20 was sold as a residence and moved to Fourth Street when an adjoining two-story brick house was purchased and remodeled in Spanish design for a Sisters' Home and Covenent at a cost of $20,000. This departure was accomplished during the pastorate of Rev. T. Austin Dunne, who also before his passing on Feb. 6, 1925 started the work of enlargening and overhauling the pastoral residence next to the church, which was completed in the fall of that year at a cost of several thousand dollars. 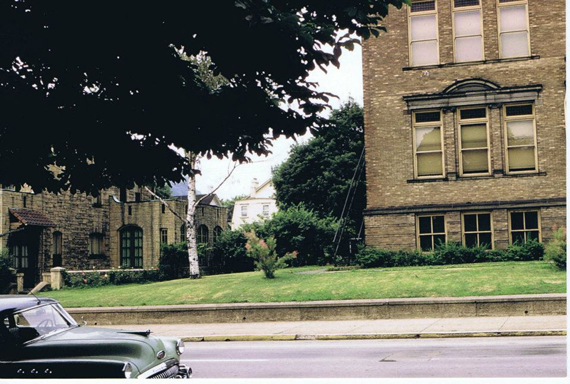 The building now presents a stone appearance and the grading and horticultural work on the lots in and about it and in the rear of the church, school and convent lots has made of the entire property owned by the church on Fifth Street of greatly increased value and enhanced appearance. Throughout the years the church's growth has been continuous and steady. 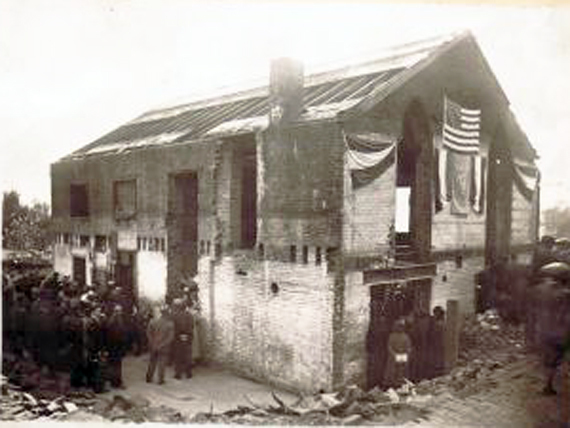 In 1918 a second church building in the city became necessary when a frame structure with a large basement was erected in the East End on Pennsylvania Avenue by Rev. T. A. Dunne at a cost of $10,000. Its first pastor was the Rev. Jerome Reidy, of Cleveland, who formerly had been an assistant to Farther Smyth at St. Aloysius. Later when Father Reidy was transferred to Youngstown the church became a mission with Father Dunne in charge of both churches. Since 1921 the church has been presided over by Rev. Stanislan Cappe. An East Liverpool girl, Miss Mary Imogene Blakely, selected the name "St. Aloysius" for the church. She was the daughter of John S. Blakely, who with Ferdinand Keffer, George Buch Leet, Patrick and John McNicol, Martin Hilbert, Mrs. Henrietta Kellar, Thomas Plunkett, G. Margraff, M. Holtzman, George Darrah, George Diedrick and other zealous Catholics of that early date made possible the erection of the frame structure which preceded the present stone-brick edifice. Mrs. Henrietta C. Keffer was then the organist and vocalist and Miss Blakely had charge of the altar and general ornamentation of the church. Her brother, Walter J. Blakely, was the first boy to give service mass in East Liverpool. Mr. Blakely declared in a letter sent from St. Louis on March 11, 1904 that "several liberal and kindly disposed Protestants contributed to the expense of building the church. Our beloved 'Old Doctor Ogden' frequently attended the services. Rt. Rev. M. G. Boff, later vicar general of the Cleveland diocese, was one of our earliest 'occasional pastors.'" NOTE: There are three windows shown in this picture. The second or middle window. The Third window. When the interior of the church was remodeled these three windows were covereed up on the inside. Close up of the three windows. The first. This window has a name, it's called the wheat. The third. This window is called the grapes. The Rev. Patrick J. McGuire, a native of Ireland, where he was born in 1841, was the first active pastor at St. Aloysius. He was appointed to the church at Summitsville and Columbiana County missions in September of 1864, which he served for ten years, when he was called to the pastorate of St. Bridget's Church in Cleveland, which he held until February, 1876, when he was returned to St. Aloysius in East Liverpool with Wellsville as a mission. He remained in East Liverpool until sent to St. John's Church in Canton. Father McGuire was possessed of brilliant talents, fine literary tastes and a fortunate physical organization which gave him a mental balance and a happy temperament that stood him well for the pastoral duties. He was succeeded by Father Denes Tight, who twice for brief periods, held the pastorate at the church. In November, 1879 the Rev. John P. Carroll, a native of New York City, became pastor and continued as such until March of 1893, when failing health compelled him to resign. For nearly a year he was a patient in Charity Hospital, Cleveland, where he succumbed on Feb. 6, 1894. His remains were brought to East Liverpool and interred in St. Aloysius Cemetery. From March to Dec. 5, 1893 the Rev. John C. Desmond, a native of Cork, Ireland, assumed the church's leadership only to be taken ill and removed to Mercy Hospital in Pittsburg where he passed away. Fathers James Cullen, J. T. Cahill and E. J. Murphy filled in for brief periods during these early pastorates. The Rev. Thomas M. Smyth, who was born in Morristown, N. J., May 27, 1847, succeeded to the pastorate in December of 1893, he coming to East Liverpool from Ashtabula, Ohio. He served until 1915 when he died in the pastorate residence. His remains were interred in the Catholic Cemetery on Pleasant Heights, East Liverpool, following a funeral that was attended by numerous dignitaries of the church. That year he was succeeded by Rev. T. Austin Dunne, a native of Canton, Ohio, who served until his passing in 1925. His remains were taken to Canton for interment. In the summer of 1925 Rev. T. E. Walsh, of Cleveland, was transferred from Youngstown to East Liverpool and is now in charge of St. Aloysius. Since its organization St. Aloysius has had several assistant pastors. The first of these was the Rev. Thomas J. Mahon, of Youngstown. 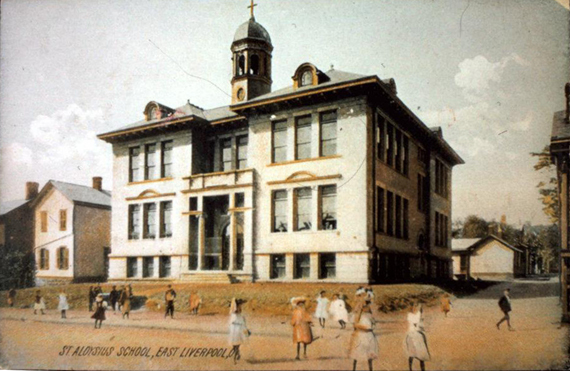 He came to St. Aloysius in June of 1901 and remained over three years. Those who have followed him for varied periods have been Revs. James Cummings, Jerome Reidy, Michael J. Flannagan, Thomas J. Gaffney and the present incumbent, Walter Fowler, all of Cleveland. The latter has served since 1923. The church throughout the years of its activity has turned out from its membership some notable members of the priesthood. These include the Rev. Patrick Farrell, D. D., who was born in East Liverpool Oct. 28, 1862. He graduated in one of East Liverpool's first High School classes, it having but three members: himself, John J. Purinton, later the state senator and leader in the Pottery City financial world and Rev. A. H. Lucas, later a prominent Methodist minister in the East. Rev. Mr. Farrell took post graduate work in Rome, Italy. He became pastor of St. John's Cathedral in Cleveland and Chancellor of the diocese and also taught in the Diocesan Seminary. He died in 1910 and was buried in East Liverpool. Another is the Rev. William A. Scullen, nephew of Rev. Farrell, who also became Chacellor of the Diocese under Bishop Farelly, of Cleveland. Other pastors developed from the church are Revs. John McKeever, of St. Martha's, Akron; Cornelius Mahoney, of Alliance and Daniel O'Shea, of Gerard, Ohio.